I’ll have more to say about this soon, of course, but I finished printing the book’s last piece—the cover, naturally—on Wednesday. Everything is in the hands of the bookbinder, and she’s started to work. This week was also busy because the School of Visual Concepts screened the movie Pressing On, an emotionally fulfilling and deep film about the end of an era of letterpress paired with handing off the torch, as much as feasible. I moderated a panel with four of our local letterpress community of note, but about half the audience could also have been on the panel—we have a great bunch of people here. Then on Saturday, SVC threw its annual Wayzgoose, traditionally a celebration when apprenticeship ends for one group and a big feast happens. For us, it was an open house in the letterpress studio, an exchange of letterpress goods (I bought some matrices for Linotype and Ludlow casters just to have some! ), and a marketplace. I had a table—first time I’ve ever done that—and sold a modest amount of stuff. But my intent was to chat with people about my project and about what they’re working on. I’ve just put up a lanyard I designed for type geeks that I had made for the Wayzgoose, and I’ll have some other items for sale in the near future, too. My type-geek lanyard with rulers and gauges. Last Tuesday and last night, I hosted folding parties at SVC, where letterpress friends came and help me fold and collate the roughly 3,000 folios (folded sheets with two pages on each side) that will wind up comprising about 125 to 150 books. The numbered edition is 100, and then I need additional copies to give as gifts, and to have copies for myself and as artist’s proofs that I’ll offer on a very limited basis. I’m also planning to sell a few special copies and donate the proceeds to local nonprofits that I’ll describe later. I tried to print between 175 and 200 copies of each press sheet, because problems invariably occur that will make a given folio unacceptable or unusable. With some sheets have three colors applied, that made the odds high I'd have to discard some number even after having done so by noticing issues during printing. 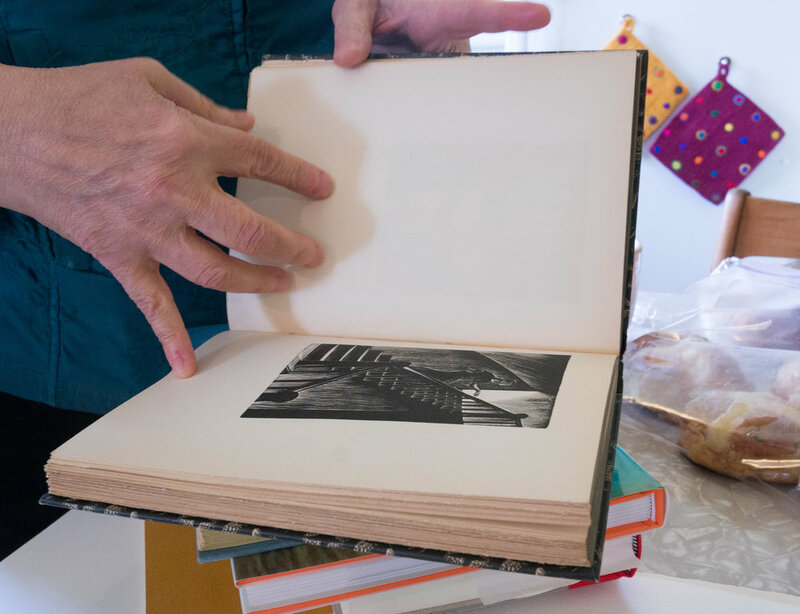 With instructions from the bookbinder, Jules, we lined up each folio so that it was even on the top and the deckle edge was averaged cross the straight edge. This was imprecise, partly because the deckled edge varies enough, there’s no exact halfway point. The first fold was lightly with a finger. 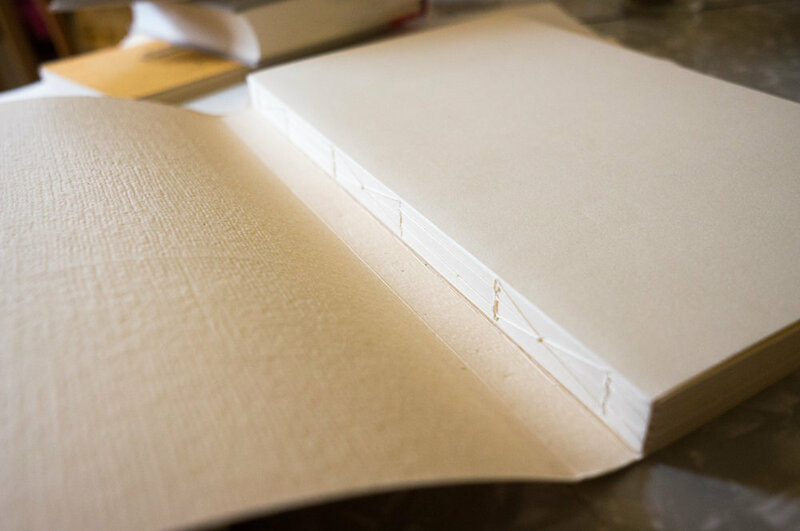 After folding all of four folios, we collated them into the binding order, and then used a bone folder to more strongly crease the edge without making it too sharp. Part of the process involved QA (quality assurance): my mentor or I looked at every folio after folding to make sure there were no printing errors, ink stains, or paper imperfections. This weekend, I’ll print the very last parts of the book, the endpapers and cover, and a week from Friday deliver it all to Jules, who will then start cutting, sewing, and gluing. Our current target date is to have some copies by September 16, the date of SVC’s Wayzgoose, a traditional printers’ event, the name of which has uncertain origin, but which celebrated the crop of printer‘s apprentices becoming journeymen with a feast. The Wayzgoose is a public event. I’ll have a table with some modest items to sell and give away, and mostly be there to show off the book project and explain it to those interested. I’ll also have some spare folios and sheets to give away to anyone who would like a piece of the book that won’t wind up in a book. I hope to see some local folks there! I also finished printing and trimming the keepsake part of the project, a folio about Walt Whitman’s poem, “A Font of Type.” I then spent a good 10 or 12 hours packaging it, labeling it, and putting on postage, and it went out to backers and later purchasers worldwide on Monday morning! Copies are still available: you can order here. I’ll also sell remaining copies at the Wayzgoose. A folio on this poem: the poem on the cover, and inside a researched essay about Whitman’s history as a printer, the poem’s provenance, and the meaning of terms and concepts he uses that are obscure to a modern audience. I printed the first side of the keepsake in two colors. I’ll have side two finished soon and then will be shipping those out. A week ago, I set the type by hand for the endpapers, which took about eight hours, including corrections. It’s a great experience to have. I should be printing the first past of those on Saturdays. I have a second color for them, too, and that may wind up being on a different day, depending on how it goes. Today, I cut the interior pages down to size. This was incredibly nerve wracking. If I made a mistake on a single press sheet, it might add 12 hours to the project. If I made a mistake consistently, I'd have to…redo everything. I believe I cut everything correctly. See the video below. On Tuesday, I’ve gathered a small group that will be helping me to fold all the interior pages, which number about 1,200 (enough to make roughly 150 books). In the process of folding, we’ll find rejects or ones that aren’t quite good enough to include. Then I hand the folded pages off to the bookbinder! This has shifted a little bit later in the month, so the first finished books won’t ship until September, but I’ve shifted the schedule back just by a week or so. The last impression of the last interior page! There were times when all that stretched in front of me seemed to be an infinite number of turns of the crank of Eve, the name for the semi-automated Vandercook proof press on which I’ve printed the entire book. But cranks pass, impressions pass, pages fill up with black and then color, and, one day, I’m done. Eve’s serial number, indicating she was made in 1946. I pulled every impression in this book with two exceptions. My children visited one day that I was printing, and I showed them how it worked, and they each pulled one sheet by themselves. That's a different kind of Easter egg—you won't know which sheets they printed (nor can I remember). But it was a lovely way to have part of them in the book, too. These are all much less ambitious and more straightforward to print than the multi-color large press sheets that make up the book. A hint of the Easter egg. Thanks for your trust and encourage, and I’ll soon have a plan for cutting and folding the pages in consultation with my bookbinder, and then she’ll start binding books to send out! This is the very last impression needed for my letterpress book. The second color is far, far easier to print, as I expected. Because everything is already registered and backed-up front and back in black, I’m just dialing in very small areas. It takes much less time and it’s easier to make adjustments when I’m off on the order of 1/72nd of an inch (1 point) than with entire sheets. Color consistency is important, but it’s easier to tolerate a wider range than with black, where your eye picks up differences very quickly. The two passes today took about one-third to one-half less time than my black passes. If all goes well tomorrow, I may print three color passes, and be at 5 of 13 done. This means I need to step up a few other design tasks that need to be finished so I can be ready to print the chapter numbers, end papers, and cover. Momentous day today! I printed the last black-ink pass of the book — the 16th of 16 passes! I was able to take one of each sheet, cut them (badly) to size, and fold them as they'll be bound in the book, and, well, it’s pretty exciting. After hitting the doldrums at the end of my printing sprint, I was refreshed and in a few sessions printed the remaining passes. Over time, I’ve been able to control the page “color” better (relative darkness and overall evenness), but variation is less noticeable when the book is folded into pages as you don’t see the up to four pages on a sheet at once. I was definitely pushing the capability of the 70-year-old-plus press. I recorded a video today narrating the process of how I was making decisions and how impression, inking, and the printing surface all work together. The second color, the ink for which arrives in a couple days. I have 13 sides of sheets to print illustrations and a period on the title page (!) for that. Picking chapter numbers, cutting them on a laser cutter, mounting them on plywood, and printing five sheet sides that have chapter numbers. Designing, hand composing, and printing the end papers with backers’ names. Turning the cover concept into a design and determine how it will be printed, debossed, and/or engraved or cut. Planning is next to godliness. I had a long talk with our bookbinder last night about thread and other details to keep the scheduling moving along. At the current rate, I should have the rest of the printing and other elements done within July, possibly by the third week, at which point I’ll cut the press sheets to folios, have a folding party with letterpress community friends, and deliver the stacks to Jules, the binder. All the sheets that will make up the finished book. About 11 days into printing, with me on press for about eight of those days, for three to nine hours per session, I’ve hit some walls. The printing is still going well (I'm about half done with the black passes), but I’m discovering the limitations of printing large pages with fine type on an old proof press. Before I get into details, here’s a time-lapse recording I made of several hours of printing the other day. It’s pretty cool! My friend Jeff Carlson came in and shot a ton of photos a week ago Saturday, and I should be able to share some of those with you, too. A proof press runs rollers over type following by pressing paper in a continues line across print surfaces. On a platen (or clamshell) press and similar full-impression presses, pressure is distributed simultaneously between the entire print area and paper. A proof press can be dialed in fairly precisely, but the nature of the beast makes it more likely you can see variation both from across the direction of printing and with the direction of printing. After some erratic results, my mentor suggested that the heat from outside (the press has a bank of windows facing south) and the continued use of the ink rollers over the course of a day could easily result in warping. Uneven ink rollers, bulging in the middle or flaring to the ends, results in uneven inking, which results in uneven printing. I'll likely limit my on-press time with black ink to a single pass (about three hours) instead of two per day to avoid this, since temperatures are heating up. The press is air conditioned, but that doesn't mean it's perfectly cooled. The more general problem is that it's very difficult to keep a consistent page color and ink color over long runs. One of the press sheets I just finished (side 9 of 16 with black) I’m rethinking—I think its opposite side is too gray relative to other pages printed and the side I just printed. I may wind up re-doing both sides for consistency. I knew this might happen, and I have plenty of paper to do so. It adds about six or so hours to printing time, but it's critical that the black all be roughly the same, or it’s extremely noticeable. I have to look at it again in good light. The second color pass for illustrations and the third color for chapter numbers are much more straightforward: less area covered, not intended to be legible in the same way as the black text, and easier to set up and print. My print-planning guides. They show press sheets, folios, pages, and signatures (8 sheets, 16 folios, 4 signatures, 64 finished pages), and which colors appear on which pages, and which passes are done. The gold is the second color; purple, chapter numbers. This is all a learning experience. I've put more time in on a press in the last two weeks than in the last six months, and every day I learn new tricks and insight. I want to make the best book I can, but I also recognize that in learning as I go, I’ll find I could have done something better, and have to consider whether I proceed or go back. In general, everything looks good, and the photopolymer plates and the press are performing well. I just have to keep working on being able to tune the press as I go and its conditions change even over the course of a run. Amazon brings a 55-foot tree into its Spheres just two blocks from SVC. Because I'm printing so much and printing on a sheet of photopolymer, which really grabs the paper and pushes against the tympan, the packing material slips over time. My mentor noticed this at one point, and she caught it before it shifted enough that the paper wasn't making an impression against the bottom of the plate! So every 100 sheets or so, I have to disassemble the tympan, get the packing back in order, and tighten the whole thing back up. Unrelated, it’s lovely working in the just-north-of-South-Lake-Union district of Seattle. On the edge of its history, in the middle of change, in a beautifully arrayed building, in a perfect letterpress shop, with wonderful people on staff and in the school's community. Everything is in flux: an old building one day is a pit the next and a skyscraper seemingly the day after that. But then a tree appears in the glass jungle. I started printing yesterday morning and have already chalked up about 16 hours on press. What did I accomplish? Printing one side of each of the first two press sheets of the book. The book has eight press sheets, which need to be printed in black on each side; 13 sides also get a second color for illustrations and other uses; 5 sides will have chapter numbers printed (6 chapters, but two happen to be on one side of a press sheet). That adds up to 34 passes, and I took 16 hours to carry out two of them—roughly 6%! That's not sustainable, you must think! Planning is critical—and it consumed a lot of overhead time in getting set up in the first couple of days. It's not. I was learning a lot about the parameters of printing this particular book, including sorting out issues with ink and layout. I opted to save some money on plates by "ganging up" some elements that appeared on different pages and places to consolidate into a small area, as plate-making is charged by the square inch within a rectangle formed by each page in your order. So a blank page in a four-page layout costs as much as a page full of type. Unfortunately, it wound up adding some much complexity for alignment that it wasn't worth the money saved, and I'll be sending the rest of the plates off as full press sheets. It's more likely that a single side will take about 2 to 4 hours to print, depending on how many different elements are on that side. That's a much more reasonable 100 hours or so, which was in line with my estimates. I'll still be pursuing my day job (freelancing) intermingled with printing. A stack of the first side of the first press sheet. My work makes an impression on me. My target is printing all the black in the book (16 passes) in the next two weeks, and start on the color parts. It will certainly slip in July to get all the printing done, but having started, it all seems more achievable! Everyone stands on the shoulders of others (sometimes giants!) to make anything. None of us mine iron ore and smelt it, create silicon designs from our chips and build fabrication plants, or cut down trees, mill them, and make our own plywood. We’re all part of a big industrial and economic ecosystem. But it's true at a micro level as well. This was a big, big day in progress on the book, which I would like to reveal will be called Not To Put Too Fine a Point on It. While the project I called "Hands On," the book has a different nature and thus a different title, and encompasses the book, the keepsake, and the village and community that’s been nurturing me. Why such a big day? Scott Hill, owner of Evolution Press, dialing in the automated cutting program. My mentor did the cutting. My bookbinder, Jules Remedios Faye, sent a glued and sewn dummy of the book using samples and printed scraps from my tests. It looks magnificent. I’ll post nice photos later. I am in love with what she, Jenny, and I came up with as the approach. Boxcar Press, which is providing a significant discount for this project, produced the first signature worth of plates for me. That's two press sheets, which comprise four folios, which will be cut down, folded, and sewn together. There are four signatures total. Those plates arrive Friday! All of these contributions of time, insight, and effort have made the book better, and made it not just my thing, but the product of a community of knowledge that incorporates all the people touching it and all their teachers and colleagues. When you print, you become part of a thread of people and expertise that spans an unbroken passing-on of lessons across nearly 600 years—and even further back for paper and other specialties. The current plan has me starting to print, very carefully, on Saturday, and then printing every day for the two weeks that follow. To make sure I have enough quality prints done, I will likely be printing 200 press sheets, which are printed in two or three colors for each side, making a maximum of 8 sheets by 2 sides by 3 colors by 200 copies or 9,600 impressions. In actuality, because the third color will be just for chapter numbers, and because there isn't a second color on every page, it will be more in the 6,000 to 7,000 range. This keeps the project roughly on track for its late August shipping. July and August will involve finishing up any interior page printing I didn't get done during the two-sprint; the end papers; the cover treatment, which is still under consideration; and the binding. And I'll be printing the keepsakes in there, too. It’s allergy season in Seattle, which has unfortunately knocked me out at times, delaying some of the work on the book, keepsake, and other projects. Nonetheless, things are moving forward, and I’ve made decisions and am proceeding towards a final design, binding choices, and the rest. The keepsake. I’ve decided on what it will be: a setting of Walt Whitman’s “A Font of Type,” a poem from 1888 that has a lot of resonance in his life, as he started work at age 13 apprenticing as a typesetter. I created a design, but after consultation with my mentor, am reworking it entirely from a small poster into a folio, or a folded sheet. The book design is a gating item at the moment, to get plates made for printing, which will push the keepsake design finalization and printing back into late May or possibly into June. The book’s type and interior. I tested out some type choices and sizes by having a photopolymer plate made and then printing on the paper stock that I’ll use in the book on the press at SVC that I’ll print all the interior pages. Learned a lot that informed the design choices and how I’ll make and integrate illustrations. The book’s binding. Jules Faye will be binding the book. She has a long and wonderful history with printing and bookbinding, and we’ve met twice to talk options and budgets. We’ve settled on a format that will expose some of the stitching and binding methods in an attractive and functional way. Unrelated, a business card. This is a project I’m doing in the one letterpress class I’m taking this term, learning to use the Chandler & Price platen press in the SVC studio. The card’s front uses a digital face created at Hamilton Wood Type Museum that’s chromatic: it has multiple elements designed to be interlocked and overlaid that may be printed in different colors. It's something used commonly with wood type to great advertising effect. On the back, I’m setting in metal using a chromatic telephone that an instructor identified in one my photos: it's a dial phone that is designed as two separate pieces of metal type that neatly intersect. I'll also be used some ornaments and handset type. One of my goals with all the printing projects underway, especially the book, is to be sure that my printing skills are good enough to achieve the level of quality and competence required. I carved out a particular set of parameters with the book to make sure that it would be both an interesting piece of work but also be achievable for me to print without years of training. The longer I print, the more nuance I’ll gain, plus I keep re-learning things that I lost the muscle memory and detail for in the past. Lots of knowledge and half-learned bits of practice keep bubbling up, both in the letterpress side and in designing the book. My mentor, Jenny, is keeping me honest: if I get underway with the book, and it seems like I can’t print as well as I need to, we’ll hit a pause button while I get more practical work under my belt, and I’ll inform everyone of delays. I’m not going to go to all this effort and with all your trust and produce something that’s subpar. Learning to use these presses involves both very few variables and a million ones. The proof presses that are the workhorse of modern letterpress weren't designed for production printing. They were designed to let press operators pull proofs of work in progress and test out printing. This means that elements like the set screws that lock in ink rollers to keep them a precise height to layer a film of pigment on type and other material in the bed of the press shift even when you've done everything right, over inking or under inking pages, and if you're not attentive and don’t stop, recalibrate, and continue, you could wind up with a rash of bad work. I know all the coarse aspects of the press, which are few: How to lock type and other elements properly in the bed. How to pack the tympan, the padding that underlies the paper as you pass the paper over the material to be printer. How to set roller height. How to apply ink. How to oil the press to keep it in fine fiddle. But I don’t have a deep bench. I've put in tens of hours on press in the last few months, not hundreds. I don’t want to print as an amateur, even as I know I lack the full experience required to print expertly, which means being able to respond to all the variables, troubleshoot them, and proceed within the range of quality required. Fortunately I’m being backstopped by Jenny, Jules, and others in the community providing insight — and moral support. Last night in class we had four letterpresses going: two running the two passes on a poster for an upcoming event, designed by our instructor and my mentor, and the other two printing the card backs for greeting card blanks used in class projects. It was a good refresher in press setup, and I finally was up to speed enough to run the platen (clamshell) press that likely forms most people's idea of what a letterpress is. We have a modestly sized manually operated platen with a treadle. You spin a wheel, and then use the treadle to keep it running. You've got to keep in rhythm to pull one page out after printing and put a blank sheet in. The second video contains actual footage of me printing. My visit on Monday to Jules Faye, the bookbinder and printer, was wonderful, and I'm moving forward on collecting more detail and making more decisions for her to provide me with a bid and nail down more scheduling details. Among other things, Jules convinced me that a folded 11 by 17 signature folded to 8½ by 5½ pages might look too ordinary. It's the same thing as folding a sheet of office paper in half, and she worried the book might feel too familiar in the wrong way. I agreed! It had bothered me and I hadn't put my finger on it. With the paper I'm nearly positive I'll use, I can instead cut a slightly different proportion. European paper sizes rely on the "golden section" proportion, which is 1:1.618. This is a particularly pleasing ratio for whatever reason our brains decide so, and it's only for odd historical quirks (as with everything in industry) that America uses 8½ by 11 as a standard. So instead of an 11 by 17 sheet, I'll cut to A3, which is 297mm by 420mm (11.7 by 16.5 inches, roughly). That can be folded twice to get an A5 sheet, which is 148mm by 210mm (5.8 by 8.3 inches). A bit squatter, and a bit wider, it makes it easier to form a more readable single-column text layout and incorporate images. If you prick a bookbinder, do they not bleed? Jules and her husband, Chris, ran Stern & Faye together, and had a huge barn full of letterpress gear and typecasting equipment. After Chris passed away a decade ago, Jules sold off most of their working collection to help form the nucleus of presses all across the Northwest. The casting equipment became the C.C. Stern Type Foundry, a museum in Portland. Jules teaches bookbinding and continues to practice it as a profession.